At the annual meeting of IC&RC, the Board of Directors, representing 78 certification boards from 25 countries and 45,000 reciprocal-level credentialed professionals, elected new leadership. Phyllis Gardner, Professor of Sociology at Texarkana College, was elected President, and Jessica Hayes, Executive Director of the Illinois Certification Board Inc. (ICB), is the new Treasurer. Both offices hold two-year terms. Gardner holds a doctoral degree in Sociology from Texas Woman’s University and is a Licensed Chemical Dependency Counselor, Certified Clinical Supervisor, and Certified Advanced Addictions Counselor. She has served the Texas Certification Board of Addiction Professionals in various capacities since 1990 and is a past president of the Texas Association of Addiction & Prevention Professionals. Her most recent role at IC&RC was Chair of the Credentialing Services Committee, which oversees the maintenance of all IC&RC examinations and credentials, as well as related products. The Board Administrators elected Debbie Gilbert as their Representative to the Executive Committee. Gilbert has been Executive Director of the Iowa Certification Board for almost a decade, and she has served as the Chair of IC&RC’s Marketing Committee for six years. Immediate Past President Rhonda Messamore passes the gavel to newly elected Dr. Phyllis Gardner. High school diploma or jurisdictionally certified high school equivalency. 46 hours specific to the domains. Examination: Applicants must pass the IC&RC International Written PRS Examination. Code of Ethics: Applicants must sign a code of ethics or affirmation statement. 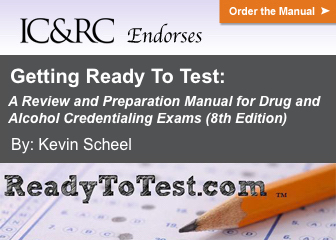 Recertification: 20 hours of continuing education earned every two years including six hours of ethics training. Supervision: The 100 hours of experience specific to the domains must be supervised by an appropriately certified or licensed individual in the behavioral health field. IC&RC provides the minimum standards for each reciprocal credential, but Member Boards may set higher standards for their credentials. The organization will now proceed with developing a full Job Task Analysis and a fully referenced examination. For its 30th anniversary meeting, IC&RC, the world leader in addiction-related credentialing, was proud to host Pamela J. Hyde, Administrator of the Substance Abuse and Mental Health Services Administration, as its keynote speaker. Hyde, an attorney with more than 30 years of experience in management and consulting for public healthcare and human services agencies, has led the agency since November 2009. Previously, she had served as a state mental health director, state human services director, city housing and human services director, as well as CEO of a private non-profit managed behavioral healthcare firm. In her remarks, Hyde stated that “We know a lot more about prevention and recovery and the whole spectrum than other healthcare providers know – and than local policymakers know.” She highlighted the fact that the misunderstanding of substance use disorders (SUD) as a social problem, instead of a health problem, leads to serious undertreatment. Only 11 percent of people with SUD are receiving treatment, as compared with 84% of diabetics – even though they affect similar numbers of the populations. Diabetes is diagnosed in 25.8 million people, substance use disorder in 22.5 million people. In addition to lack of treatment, Hyde also voiced federal concerns about disparities in disease rates and in the workforce. SAMHSA is coordinating efforts to address the needs of underserved populations: ethnic minorities, American Indian/Alaskan Native, lesbian-gay-bisexual-transgender-queer, and women/girls. She stated that minorities make up 30 percent of the population, but only 20 percent of counselors. Hyde described SAMHSA’s focus on recovery. With extensive input, they have developed a working definition: “A process of change through which individuals improve their health and wellness, live a self-directed life, and strive to achieve their full potential.” She informed IC&RC delegates of a new technical assistance center for recovery, called (BRSS TACS). This strategic initiative will include funding for Recovery Support Services in health reform and the block grant. Hyde encouraged IC&RC to convene people working the area of peer recovery. Later that day, the IC&RC Board of Directors voted to approve two levels of Peer Recovery Support credentials, including standards. The next steps are to develop a Job Task Analysis, then a fully referenced examination. Utah adopted the Prevention Specialist. 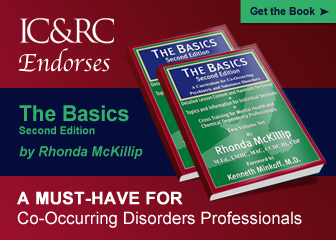 California will now offer the Co-Occurring Disorders Professional Diplomate credential. Rhonda Messamore, IC&RC President, presented the Presidential Leadership Award to Julie Stevens, Chair of the Prevention Committee, in recognition of outstanding contributions and support given to IC&RC and the substance abuse and prevention profession. A Licensed Chemical Dependency Counselor and an Advanced Certified Prevention Specialist with 25 years’ in the prevention field, Stevens is currently employed as Training Specialist for the University of Oklahoma’s Southwest Prevention Center. Julie Hogan, Co-Director of the National Center for the Application of Prevention Technologies (CAPT) and an inaugural member of the IC&RC Advisory Council, joined the meeting as a special guest. President Rhonda Messamore (right) presents an award of gratitude to SAMHSA Administrator Pamela J. Hyde. Rob Morrison, Executive Director of National Association of State Alcohol and Drug Abuse Directors (NASADAD), was represented by his staff member, Henrick Harwood, Director of NASADAD’s Division of Research and Program Applications. Ron Manderscheid, Executive Director of the National Association of County Behavioral Health and Developmental Disability Directors, has accepted the invitation to sit on the Advisory Council, but couldn’t attend the Orlando meeting. The IC&RC Advisory Council seeks to ensure that the profession of addiction treatment and prevention continues to grow in a smart, sustainable direction. Together, these experts will create a network to provide guidance, vision, and support to IC&RC as it responds to shifts in the global economy, public consciousness and diverse values. In 2010, Anthony Coulson retired from the Drug Enforcement Administration (DEA) as the Assistant Special Agent in Charge of the DEA's Tucson District Office and directed the Federal Government's drug enforcement strategy in Southern Arizona. He began his career with the DEA in 1982 and has served in Washington, D.C.; Tucson and Phoenix, Arizona; Los Angeles, California; and Songkhla, Thailand. In 1996 and 2002, he received the DEA’s highest award, the Administrator's Award for Exceptional Service. Coulson explained that 90 percent of drugs in this country enter through the southwest border, and he emphasized that, at 2,000 miles long, the U.S. southern border can never be secured. “I’m a big proponent of putting people in jail,” summarized Coulson. “If they have a problem, give them treatment. But I don’t want to see them again.” He argued that dealers and traffickers need to be removed from communities, so that the communities have time to heal. He added that there must be strategies in place to facilitate that recovery. More than 75 delegates from Member Boards gathered to set the direction for the future of the international organization. One new board – Colorado Prevention Certification Board - was joyfully welcomed into the organization. Carmelita Muniz, Mary Anne Burdick, and Cheryl Reid represented the new board at the meeting. Tammi Lewis, LPC, AADC, ALPS, Therapist at CAMC Family Resource Center in Charleston, West Virginia, is the new co-chair of the Advanced Alcohol and Drug Counselor (AADC) Committee. IC&RC protects the public by establishing standards and facilitating reciprocity for the credentialing of addiction-related professionals. Today, IC&RC represents 76 member boards, including 45 U.S. states, the District of Columbia, two U.S. territories, and three branches of the U.S. military. Members also include 22 countries and six Native American territories. 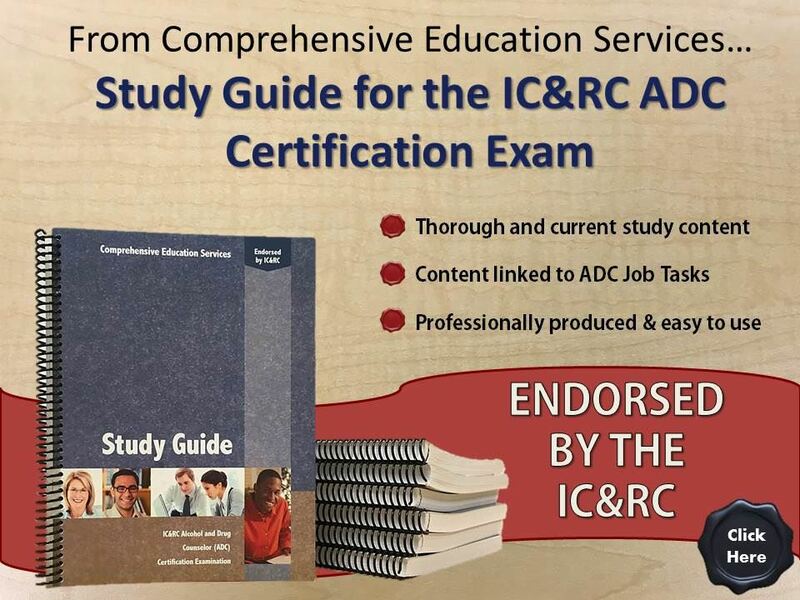 IC&RC credentials include Alcohol and Drug Counselor (ADC), Advanced Alcohol and Drug Counselor (AADC), Clinical Supervisor (CS), Prevention Specialist (PS), Certified Criminal Justice Addictions Professional (CCJP), Certified Co-Occurring Disorders Professional (CCDP), and Certified Co-Occurring Disorders Professional Diplomate (CCDPD). On March 12, IC&RC joined an expert panel, convened by the Substance Abuse and Mental Health Services Administration (SAMHSA), to discuss “Scopes of Practice in the field of Substance Use Disorder.” The meeting was facilitated by Senior Public Health Advisor Linda Kaplan. “As you are all aware, the field of addiction services is facing a workforce crisis,” stated Beth Fraster, LICSW, Senior Program Associate for Advocates for Human Potential and organizer of the meeting. “Yet, with the passage of the new Parity legislation and the hope of health care reform, it is also facing real opportunities for new business development and potential growth. SAMHSA and other leaders in the field are focusing on strengthening and supporting the professional identity of the addiction workforce. Rick Harwood – Research and Program Applications Director for National Association of State Alcohol and Drug Abuse Directors, Inc. Working in small groups, the panel discussed recommendations for the development of a Model Scopes of Practice. The group identified elements of existing Scopes of Practice for the addictions profession, as well as criteria for levels of education and experience. IC&RC supported the concept of moving toward a uniform national model for Scopes of Practice. “We believe that, in addition to educational degrees, competence should be determined by a nationally accepted competency-based testing process,” explained Mather. SAMHSA staffers present at the meeting indicated that they would develop a Summary Document outlining the experts’ recommendations for Scopes of Practice for alcohol and drug counselors at the HS/GED, associate’s, bachelor’s and master’s levels of education. SAMHSA will also circulate the report nationwide, with the hope that states will give serious consideration to aligning their local scopes of practice with the recommendations contained in the report. IC&RC sets the international standards for competency-based certification programs in addiction counseling, prevention, criminal justice, co-occurring disorders and clinical supervision through testing and credentialing of addiction professionals. It is comprised of 73 credentialing boards that represent over 40,000 certified addiction professionals, located in 42 states, the District of Columbia, two U.S. territories, and 13 countries worldwide, as well as affiliations with the U.S. Army, U.S. Air Force, U.S. Navy and Marines. IC&RC presented its Presidential Leadership Award to Stefán Jóhannsson, in recognition of outstanding contributions and support given to IC&RC and the substance abuse profession. On behalf of the organization, Vice President Doug Rosenberry lauded Jóhannsson as “a man of action, who founded the Icelandic School of Addictions after a long and illustrious career. IC&RC would be poorer without his influences and bulldog persistence.” Jóhannsson has promoted IC&RC throughout Europe, at conferences for ICAA, UKESAD, and NORDAN. Puerto Rico’s Certification Board for Professionals in Addiction & Alcoholism was accepted for Prevention Specialist. The Association of Professionals Specializing in Addiction Counseling in Singapore was approved for Co-Occurring Disorders Professional and Co-Occurring Disorders Professional Diplomate. International & Cultural Affairs became a standing committee, with the purpose of developing and implementing a strategic plan for the advancement of IC&RC products globally, assisting and supporting groups globally that are interested in joining IC&RC, and assisting the organization’s efforts to work effectively across different cultures and jurisdictions. The name of the Products Committee was changed to Credentialing Services, reflecting its focus on credentials and related activities. Revised Mission and Vision Statements were approved. IC&RC sets the international standards for competency-based certification programs in addiction counseling, prevention, criminal justice, co-occurring disorders and clinical supervision through testing and credentialing of addiction professionals. It is comprised of 73 credentialing boards that represent over 40,000 certified addiction professionals, located in 44 states, the District of Columbia, two U.S. territories, and 12 countries worldwide, as well as affiliations with the U.S. Army, U.S. Air Force, U.S. Navy and Marines.